Lumbermens Merchandising Corporation began its working relationship with DDA in 2008 with the custom-designed website for ModernViewT Designer Series Cabinetry. Lumbermens turned back to DDA in 2011 to design and build a website that would not only advance the visual appeal of their brand but would also deliver high rankings on Google and other search engines through DDA's award-winning Search Engine Optimization services. During the planning process for the site, DDA committed itself to creating something that would raise the standards of what is expected from a professional corporate website. DDA accomplished this by creating a series of five original animations that capture the magic of outdoor scenes in motion, enticing the viewer to continue to navigate throughout the site to see more. 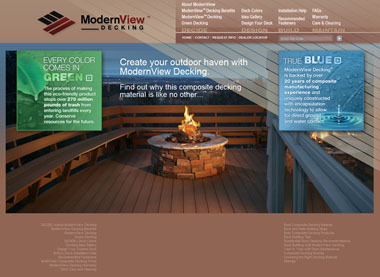 DDA also developed 20 pages of search engine optimized content to effectively direct potential customers to the site, while also programming a tool that allows users to search by state or zip code for a dealer of ModernViewT Decking. Through the combination of easy and intuitive navigation, comprehensive information, and striking visual appeal, DDA has raised the bar for what users will expect from the websites they visit in the future.